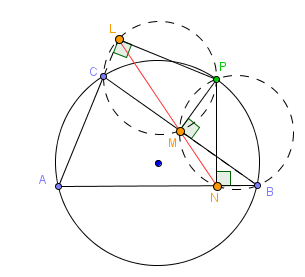 In this post, we explore the relationship between a point on each line containing the sides of a triangle that are nearest to a point on its circumcircle. In particular, consider point on the circumcircle of triangle as shown below. We want to find a point on each line containing segments , and that are nearest to . To determine the location these points, we construct three lines through that are perpendicular to the three sides of the triangle. The intersections of the lines and the sides, namely , , and as shown below are the points nearest to . Notice that is extended since the point perpendicular to is not on the segment. What do you observe? You might want to use GeoGebra, or any Geometry software, to construct and investigate the figure. From the figure, it seems that the three points are collinear. Verify this conjecture using GeoGebra or any Geometry software. Using the Geometry software, move the vertices of the triangle and see if the conjecture is always true. Use the line through two points tool and draw a line through points and . What do you observe? Are they always collinear? Notice that we can show that points , , and are collinear if we can show that . Looking at the figure above, we observe that is a cyclic quadrilateral. Since , By Thales’ theorem, points , , and are on the circle. In addition, which also means that point is on the same circle as those of , and . In effect, is also a cyclic quadrilateral. 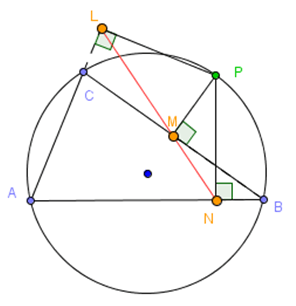 It follows from 3 that is also a cyclic quadrilateral. We now use the observations above to prove our conjecture. We know that the measure of the opposite angles of a quadrilateral add up to . As we have mentioned above, proving that $latex L, M, and N are collinear, it is sufficient to show that . This is what we want to show. The line above containing points , and is called the Simson line named after Robert Simson, a Scottish mathematician. The theorem we just proved above is the Simpson Line Theorem.